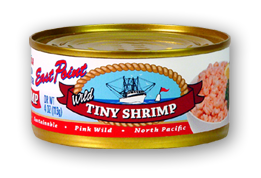 East Point Seafood Tiny Shrimp comes from the cold waters of the Pacific Ocean. It has a light delicate flavor and is carefully hand-packed to lock in the great taste. We're convinced that, because it is locally harvested and locally processed, our shrimp beats the imports hands down. INGREDIENTS: Shrimp, Water, Salt, and Citric Acid.